A 20-minute exploration of how conventional treatment of the”rules” for using the passive voice (as, for example, presented in coursebooks or standard student grammar books) misses the chance to introduce learners to a simpler, more elegant and more generative rule. An interesting lesson and a good introduction to the passive. What would be the next step for recycling and consolidating this new knowledge? I wonder how exophoric reference fits into this explanatory model. And as Mccarthy says in ‘Discourse Analysis for Language Teachers’, sequences of theme and rheme patterns are not absolute and this may cause difficulties for students who lack complex structural awareness. Thank you for commenting, Derek. I would be tempted to spend some time observing through other written text work how far the learners were experimenting with this and make suggestions as and when appropriate. Read this and tell me: a) how is Clerk feeling? Did Bob know about this before the conversation? How do we know? Bob: Hi Clerk, how’s it going? Clerk: not that good, actually – I’m off to the doctor. Who does Bob speak to when he comes in? How do we know? Why is Anthony confused? Anthony: Good morning, I’m looking for a refill for this pen. Bob: Hi, how’s your armpit? Anthony: Pardon? / Clerk: Oh hi, Bob, fine thanks – doctor cleared it right up. Bob: Oh, sorry, I was talking to Clerk! I agree with McCarthy etc that T/R is a strong tendency which we can flout, but when we do is less common than when we don’t. And either way, grasping the convention is key to knowing how to break with it on occasion! Very much enjoyed this in your teacher training course, and like the task. All the best! Glad you liked it – both times! A good explanation of a very nice lesson Anthony. I will try to take a similar approach the next time I ‘teach the passive’. Glad you liked it, Thomas, and thanks for stopping by! Looking at this again Anthony, I like the activities you present because they show learners that they have a choice to make, whether to use the passive or the active, in any given situation. I particularly like the practicing control activity where you ask students to choose between A and B. The lesson you describe would also work well as part of a series of lessons looking at grammatical choices in writing, e.g. using the gerund, using relative clauses etc etc. Is that what you’ve done? Thanks for taking a second look at this, Thomas. I like the choice-reaction element to this approach, too. I haven’t taken it to the extent you suggest, but I think it’s a very interesting idea, and one that I would like to explore when I get back to the regular classroom for a longer period. It is similar to the way I attack the past simple/past progressive distinction, though: essentially that’s down to a plot driver vs. scenic detail choice reaction, and so it lends itself to a similar text-level approach. Please do try your idea out yourself and let me know how it goes! By the way, all credit to Scott Thornbury, from whose blog, and the really interesting comment chain, I got the majority of that controlled practice task. His post P is for Passive is a great read. I think that exploring grammar through textual analysis is a very valuable and effective teaching technique. It’s something I’ve used in my own classes quite a bit, but I’m open to new ideas and to innovation. I’d be interested in finding out a bit more about your approach to the past simple / past progressive distinction. I’m a big fan of Scott Thornbury’s blog too. Although I think I remember reading the post you mention I will go back and re-visit it. Hi! First of all, I would like to thank you a lot for this wonderful blog. I came across it in the morning and I’ve been reading it all day. 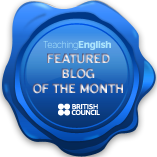 I am a novice teacher, and this blog provides a lot of useful material for me to reflect on. I was particularly struck by your approach to the passive voice because I tried to explain it from this perspective myself a couple of times. Relying on my academic background in linguistics and translation, I thought it fit to bring my knowledge of theme and rheme division into the classroom because, frankly, it is indeed a more elegant explanation than the typical coursebook ones you’ve described in your video. However, my students did not catch it well enough. Your lesson was designed for B2>C1 level students, I explained the passive voice this way to intermediate students. I would like to try to use your way one more time, but without a lot of explaining and translating into Ukrainian (especially considering that in Ukrainian we deal with theme and rheme rather differently). I wonder if you could suggest some modifications to make this kind of explanation fit for weak intermediate students. I would be very grateful for that!